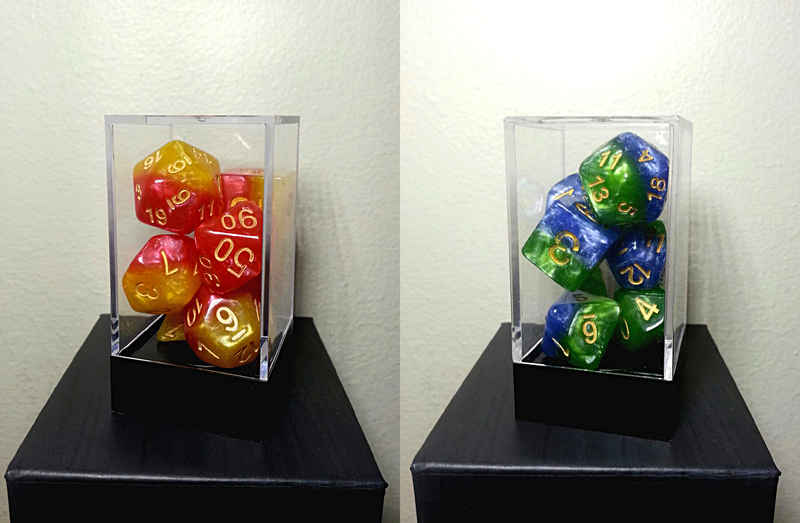 Dual-Color Dice Sets, where the color sets were chosen by the Backers! - Exclusively from Gate Keeper Games! 1,912 backers pledged $95,273 to help bring this project to life. Thanks for visiting Halfsies Dice! ...visit our home at www.GateKeeperGaming.com here. ...visit us on BGG here. ...and look for us in Entrepreneurs' Avenue at Gen Con Indy 2015! 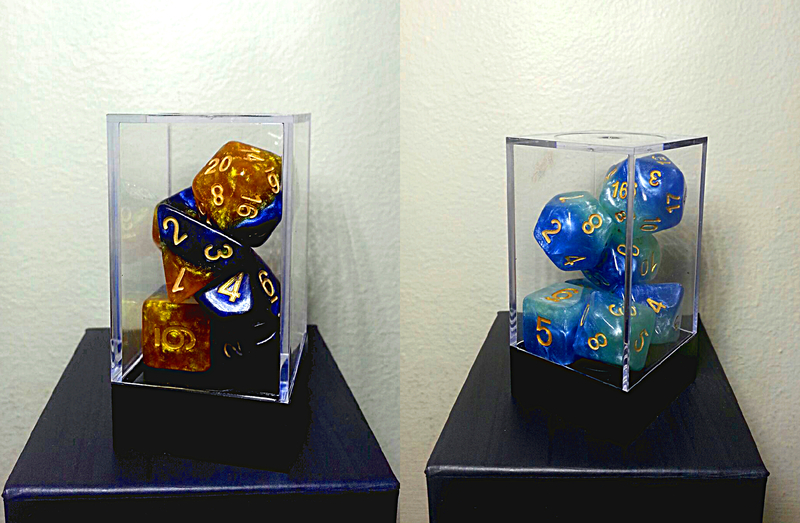 With each unlocked Stretch Goal, a new backer-selected Dice Set has been unlocked for purchase. Let's knock these 3 Over-Stretchers out. 1 Down - 2 to go! Look for Frozen Tundra & Gamma Dice in Halfsies 2.0 in mid 2015. "Why the increase in the pricing curve in the Over-Stretch Goals?" The original campaign was designed and budgeted around shipping up to 9 sets. Beyond that our shipping costs take a turn for the worse (something we've chosen to help mitigate for you beyond 9 sets). Unlocking more sets also reflects a larger number of backers, which in turn demands higher production runs for some, and eventually all, of the colors. In order to cover our increased production and shipping costs, we need to take the curve up a notch. We kinda wrote the book on Kickstarter budgeting, and promise you that these exciting Over-Stretch Goals are budgeted both accurately and honestly. A quick FAQ note about A.D.A.P.T. Halfsies Dice are all new full dice sets that feature a beautiful new half-&-half color-split design, have a pearlescent swirl within each color, and are semi-translucent for stunningly vibrant colors. 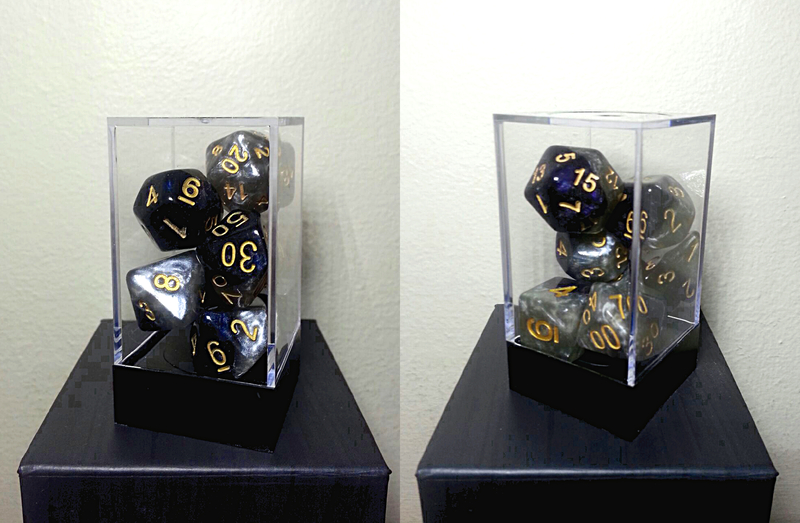 Aesthetically pleasing, and professionally manufactured these dice are a perfect addition to any collection. Halfsies Dice are manufactured in high impact resin with smooth corners, on preexisting, industry standard dice molds for a clean and reliably-balanced roll every time. Halfsies Dice have been prototyped in a number of color sets for you to see, but can and will be designed in any color arrangement you can imagine. These dice sets fit perfectly in any collection, whether you are a casual gamer, a dice collector, or just like shiny objects. Here are some dice closeups so you can compare what you have at home to what Halfsies Dice look like. These are our prototypes, but you'll decide which colors get made. More close up pics of the dice - now here. Shipping is included on all USA orders, and dirt cheap internationally, thus making them as cheap or cheaper than all other multi-color dice sets on the market. Plus we're a little guy, so we appreciate your support. To get things started, we've designed the first 3 color sets after the greatest fantasy metals of legend. After that, you choose the rest! Mithril Lore - A legendary metal first mined by the dwarves of Moria. Some say it is actually an organic metal that can be found forming the scales of certain dragons. Beautiful and engaging, these silvery blue dice make a great companion for any noble gamer. Orichalcum Lore - A rare red metal found only in the sunken city of Atlantis. Its strength and molecular commonalities with gold made it abundantly valuable. Bold and strong, this set can roll with the best of them in any dungeon crawl campaign. Adamantium Lore - Once known as the indestructible metal Adamantine that held the Greek titans captive in the underworld. Now, its popular alloy has been used to create some pretty sweet claws. These gentle green hues will soothe your mind whilst your ranger puts out long range DPS. The color arrangements for the next 5 ...er, make that EIGHT... dice sets will be chosen by YOU, and unlocked by Stretch & Over-Stretch Goals. Set #4) The backer chosen: Psionic Combat - Now Available! Psionic Combat Lore - In the world of fantasy and legendary heroes there are those that can manipulate reality by sheer force of will. Such heroes may battle one another across the infinite and colorful worlds of their imaginations. The victor emerges physically exhausted, the victim is lost to a coma. This is Psionic Combat! Set #5) The backer chosen: Magma Dice - Now Available! Magma Dice Lore - Magma is a mix of molten rock, crystals, and gas found deep beneath the surface of the earth, burning as hot as 2400 degrees Fahrenheit (1300 °C). Under certain circumstances magma will cool beneath the surface forming crystalline igneous rocks. …add a little gold paint, and you've got Magma Dice! Set #6) The backer chosen: Moonlight Sonata - Now Available! Moonlight Sonata Dice Lore - Every rare once in a while an asteroid strikes the surface of the moon sending moon rocks hurling toward earth. As they catch a glint of sunlight upon entering our atmosphere, they begin to hum a sound that, together, is almost musical. We call this, the Moonlight Sonata. Set #7) The backer chosen: Treant Dice - Now Available! Treant Dice Lore - The ents are trees so old that they've developed consciousnesses of their own. The drawback to this state is that they can no longer beget new trees; they produce seeds, but those seeds can't germinate as they too have a consciousnesses of their own. These are your Treant Dice. Set #8) The backer chosen: The Heir -Now Available! The Heir Lore - On March 17th 2014, The Heir was discovered. On November 23rd 2015, 2014, The Heir was born. On February 12th 2015, The Heir had dice named after him. On March 19th 2015 The Heir chose shared his dice with everyone. Close-up of The Heir's official prototype. These dice won for a reason! Set #9) The Legendary Yin Yang Set - We did it! - Now Available! Now unlocked, Yin Yang Dice Sets can be added to any Pledge Tier for just $7 each, no limit! Yin Yang Lore - Light is more powerful than darkness, for no amount of darkness can snuff out light, but still the two exist at the same time. The traditional Yin Yang is a visual representation of balance... like these dice... balanced! Set #10) The backer chosen: Nanobots - Now Available! Nanobot Lore - Small microbots made to function like living cells but based entirely on their own A.I. - If you can reprogram them, or just get them to like you, they'll roll whatever you want! Set #11) The backer chosen: Frozen Tundra! - Available at the $100,000 Over-Stretch Goal. Frozen Tundra Lore - These special dice are actually hail from the frozen polar ice caps of the North & South Poles that fell thousands of years ago against the barren earth. Now dug up, they have a half-life of 1,000 more years before they melt again. Get and use them while you still can! The FINAL Set #12) The backer chosen: Gamma Dice! - Available at the $120,000 Over-Stretch Goal! Gamma Dice Lore - These amazing dice were once normal ordinary dice. But after a terrible incident with gamma radiation.... they're now Incredible! Gamma Dice will make a grand re-appearance in Halfsies Dice 2.0 in mid 2015. Email us here to join our mailing list. As each Stretch Goal is unlocked, we will select the current leader of the live vote and announce the winner as the next available color set. We will then release a new survey replacing the least voted-for colors with exciting new ones and from your suggestions (in-survey and in-comments) for the next round of voting. Older color sets that are removed may return later, so hang tight if your favorite disappears for a while, and be sure to let us know in the comments that you want it back. Campaigning for your favorite color sets in the comments is highly encouraged. The link to the survey is just below the list of options. Take a new look at some new up-close pics of some the dice! 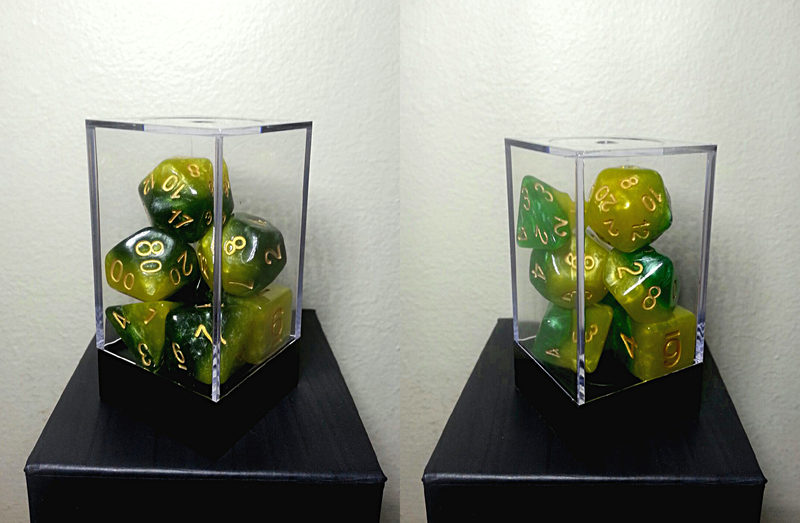 Select the most recent survey below to place your vote for the next dice color set. All surveys closed at the end of the Campaign. Though we welcome you to view the updates to see the results. 1) We need your help. As big fans & collectors of various dice sets ourselves, we invented this new half & half design to honor a promise made to our The King's Armory Backers and to bring a brand new style of dice to the tabletop. We have even begun prototyping them to ensure the idea would work. Successful in prototyping, these dice can become a reality - with your help. Plus by backing, you'll have access to participate in the Backer-Only Dice Selection Surveys. 2) Our motto is "This is your game", and is so for a reason. If you followed our first campaign, you know that A) We love your involvement, B) We believe in transparency, and C) We have a tendency to give away free stuff. Involvement: The majority of dice sets (sets #4-8) will be chosen by Backer Vote. Sure, we could pick them all ourselves, but that's not the way we roll. Transparency: All Pledge Tiers are already displayed and available from the start. No mysteries about pricing as the campaign progresses. We even posted our budget in the FAQs at the bottom of the page, and have reduced international shipping costs 3 times over the course of the campaign. Free Stuff: We've added a "Better the Odds" Tier, in which you put your faith in this campaign to see ALL Dice Sets unlocked, bettering everyone's odds of unlocking Stretch Goals, and we in turn give you the Yin Yang Dice Set for FREE when we hit that point. Plus the Saint Patrick's Day Tiers, now the Gift Package Tier! Free stuff! ...we're kinda obsessed with free upgrades. 3) These dice are the lowest prices they'll ever be. We have priced the Tiers as low as we can to make them accessible to everyone, while still guaranteeing successful production & delivery. In retail, these dice will MSRP at $9+ per set + full price shipping. Here on Kickstarter you can get them for as low as $7.00 (or less) per set! For designer 2-tone dice, that price can't be found anywhere online. Even at the first Tier, since shipping is included in your order (USA full; International in-part), they are already cheaper than ordering retail from most online retailers (because they charge full shipping in addition). And these dice get less expensive per set with each Pledge Tier. At the "6 Sets Tier" the price per set is notably less than other designer 2-color dice available online. ...even after International Shipping. And it only gets cheaper as you add more! Common online retail pricing: $9.95 x 9 sets = $89.55. This Kickstarter: $7.33 x 9 sets = $66.00. Plus our max of $23 Shipping = Total: $89.00 …to anywhere in the world ...at max! Compare these prices with any online retailer of specialty 2-tone dice. We think you'll be rather pleased. How are we able to do this? We kicked this with zero margin on these dice. We've offered up our profits for your savings. We'll make a couple bucks selling the left overs after the campaign. But you get them crazy cheap for investing your trust in us. That's the way we do things. We invite you to back us at the lowest Pledge Tier so you can join in the comments, surveys, and updates to see we do things. If at the end of all things you're not happy with your time with us, simply cancel your pledge. You have nothing to lose. Just give us the chance to wow you. Each Pledge Tier represents a quantity of Dice Sets. The more sets ordered in a single pledge the less each Dice Set costs. 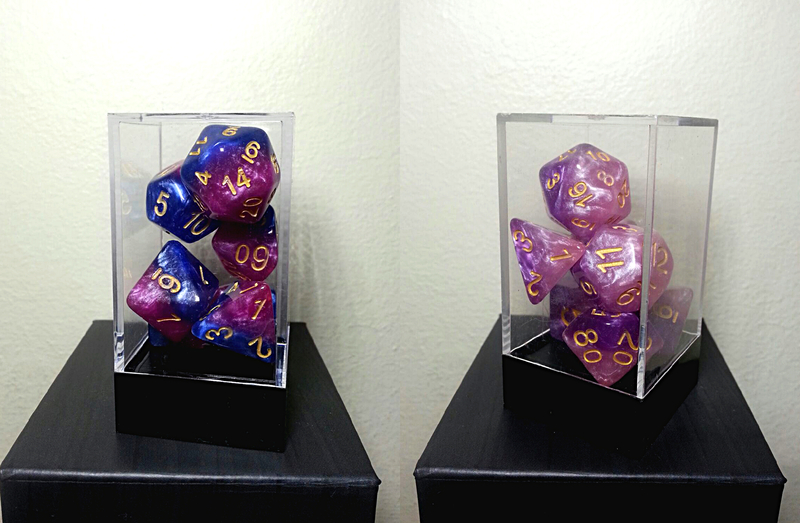 All Tiers include: A number of Dice Sets in plastic dice cases, a shipping subsidy, and entry to Backer-only voting. Final color choices for your order will be made after the campaign closes, at all Tiers. Pledge early, choose later. "Can I order multiples of certain color sets, so this campaign hits all its goals?" Click the green "Back this Project" button at the top of the page. Select the Pledge Tier that corresponds to the total number of sets you'd like to receive. Go tell your friends about these dice, so they can pledge too. At the close of the campaign, simply tell us what color sets you desire; repeats welcome. We chose the "pay for shipping after the campaign" method because it keeps the Funding Goal & Stretch Goals more transparent & accurate, while it also reduces your final shipping charges. Shipping costs - detailed by quantity of sets ordered, by area. † = "Friendly Shipping" with VAT & Customs Fees pre-paid. ‡ = Yes, we managed to successfully unify ALL OF EUROPE, Western, Central, and even Non-EU, etc. for shipping rates. EU Europe is also "Friendly"; while non-EU Europe may be subject to VAT by locality. * As we have successfully reached $69,000 in funding. These prices are locked in. Congratulations! Please DO NOT add the shipping rate to your pledge. "International Shipping got cheaper with each Stretch Goal?" Per set, yes. We budgeted in a sliding scale for shipping subsidies within our Funding & Stretch Goals, so that we could guarantee that USA shipping remains free with every unlocked Tier. As the USA subsidy grew, so did the international one. That means, the higher our funding goal grew, the less international Backers have to pay, on average, for shipping! Having already begun manufacturing on The King's Armory - The Tower Defense Board Game, we have gained a lot of experience with game production - including custom polyhedral dice - and we put that experience to work reducing the risks and challenges. It also allows us to foresee potential issues, and solve them in advance. For example: we can't be 100% certain what final International Shipping is going to cost for each Backer's unique order, so we did extensive research with multiple companies in order to provide very accurate estimates, and ultimately chose to collect shipping post-campaign. This way there's no "we ran out of money for shipping" faux pas, because each person pays what they owe by order and by region. If you get the wrong dice, experience excessive production delays, or are in any way dissatisfied with the way we fulfill your pledge, whether it be our fault or any others', we'll fight on your behalf to make it right. We've done it for our TKA Backers, and we'll do it again for you. And if we can't make it right, we'll refund your money; thus mitigating YOUR risks and challenges. Our experience with game production during The King's Armory campaign really has taught us a lot. Something that we decided to write down and share at www.gatekeepergaming.com/kickstarter-advice-columns. So when it's time for you to run your own Kickstarter, you've got all the tools you need. See the FAQ below for detailed answers to common questions. Feel free to ask in the Comments. We're there every day. You may choose from any available color sets at the close of the campaign. International Shipping to be charged at the close of the campaign; please see the EU & Canada Friendly Shipping Chart for estimated costs. Includes free USA Shipping. International Shipping to be charged at the close of the campaign; please see the EU & Canada Friendly Shipping Chart for estimated costs. Add additional sets for +$8 each. For showing your faith in this campaign so early and so strongly, upon reaching the $69,000 goal we are going to give you the bonus Add On Yin Yang (Black & White) Dice Set for free. You may choose from any available color sets at the close of the campaign. See FAQ for details. This Tier is for easy inclusion of the Yin Yang Dice set. You may choose from any available color sets at the close of the campaign; includes 1 Yin Yang set. See FAQ for bonus details. Add additional sets for +$8 each at this Tier. (Same as, though not mentioned on, the Phase 1 Tier). Add additional sets for +$7 each at this Tier. For being generous and ordering enough sets to share with your friends, we are going to give you any 2 Dice Sets of your choice for free. 36 sets for the pledge value of 34. Retailers - Please contact for rates.